By Dan Ambrose: Former three division world champion Adrien Broner (29-1, 22 KOs) says that Marcos Maidana (35-5, 31 KOs) doesn’t want to fight him again due to the tough time he gave him in losing to Maidana last year in December. Broner, #3 WBA, #3 WBC, #10 IBF, says he gave Maidana a lot of problems on his worst night. Broner thinks Maidana doesn’t want any part of getting back in the ring with him after that experience. There are serious questions about whether Broner is going to work out as a top fighter in the 140 pound weight class, because he’s not shined thus far in this weight class, and he’s not dominating like he did when he fought at super featherweight and lightweight. Right now you’d have to think that Broner will get bludgeoned into submission if he faces Danny Garcia or Lucas Matthysse. Ruslan Provodnikov would likely beat him as well, and Chris Algieri would give Broner problems as well. Broner wants a fight against Manny Pacquiao, but that’s not a realistic match-up due to Broner’s stock still not having gone up since his loss to Maidana. Maidana knocked Broner down twice and gave him a real beating. 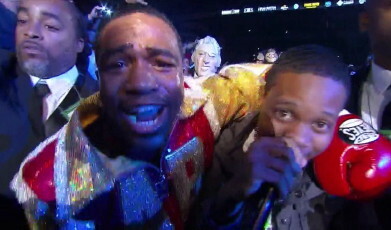 After the fight, Broner’s face was badly swollen up, and he left the ring without giving a post-fight interview. In contrast, Maidana’s face looked unmarked like he’d never fought at all. Broner has since won his last two fights against Carlos Molina and Emmanuel Taylor. Broner failed to impress in either fight. What was surprising was how much trouble Broner had in beating Taylor, because this is the same guy that Chris Algieri easily beat by a lopsided 10 round decision last February. Broner defeated Taylor by the scores 116-111, 115-112, and 116-111. When asked by GlobalGrindTV who he wants to fight next, Broner said “Pacquiao or Maidana. He [Maidana] don’t want to fight me though. You know why. I gave him the toughest fight on my worst night. I gave him the toughest fight for his career on my worst night. That was one of my funnest fights I was ever in. It was fun. I can’t wait for it to happen again. That’s a fight that changed my life for the better. That was a fight that I know I wasn’t supposed to lose. I beat myself. He didn’t beat me. I could have did some things different. That’s why I changed the way I move now. I’m happy I lost early in my career,” Broner said. Maidana’s coming off of back to back losses to Floyd Mayweather Jr, so you can’t blame Maidana for not being interested in taking a huge pay cut to fight Broner again. There’s not much motivation for Maidana to take that fight because Broner doesn’t have a world title in his possession, and he’s not beaten anyone that you can call a really good fighter since his loss to Maidana. Broner still needs to build himself back up before a fight between him and Maidana is worth talking about. Broner’s trainer recently Michael Stafford said that Lucas Matthysse wasn’t in the picture for Broner’s next fight. Instead, it’s going to be someone else.